Paragon Samples "The Nave Q Studio Kit"
Great deal for those who look for realistic, well recorded drum samples. “The Nave Q Studio Kit” is the first offering from UK-based Paragon Samples. The sample library consists of high quality studio recorded drum samples that can be loaded straight into Drumagog, Steven Slate, or Kontakt player. The sampler also offers the hits sampled at different hit velocities in .wav file format for those that want to use them as sound replacement in other apps. All samples are recorded at The Nave Studio (Leeds, North Yorkshire, UK) and mixed at 24bit/44khz .wav format. The sampler features a standard rock kit (kick, rack tom, floot tom1, floor tom 2, snare) recorded in “direct”, “close room”, “overhead”, “far room” and “hallway” configurations. 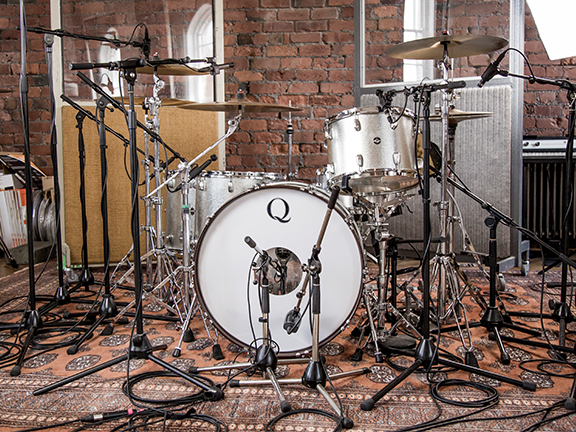 The studio kit recorded is a Galvanized Steel kit built by LA based custom drum company 'Q Drum Co'. For more info and sound samples – please visit www.paragonsamples.co.uk/. Unlike some other packages where you have to jump through a ton of hoops to get to the product, here all you need to do is to unpack the installation zip file into a folder and you are good to go. The sample library takes about 1.6 GB of storage space. On this review I tested the sample library in Drumagog and Studio One's built in drum sampler, Impact. As luck would have it, I received a session with atrociously recorded drums on a mix that I had to tackle and this sample library was a godsend! Everything loaded effortlessly in Drumagog via the provided GOG sample folders. Each drum has 5 mic position options, and depending on your needs you can mix and match as needed. In this case I couldn't completely sound replace the original sounds as the mix separation was really bad and there was a huge amount of uncontrollable bleed, so I opted to blend in kick and snare only on this session. I opted for two tracks of each, in this case I had to copy the original kick and snare onto 2 more tracks and load Drumagog. I picked one “direct” and “close room” sound for each, so in essence I had three tracks to blend in on the kick and on the snare. The sound I ended up with was essentially about 20% of the original snare and kick, 50% “direct” and 30% “close room”. In this case, it definitely saved the session. As a matter of fact, I liked this kit so much that I started supplementing my EZDrummer files with it as well, by blending in the close and ambient hits, thus creating more realism to programmed drum parts. It would've been good to have cymbal samples as well, although they are harder to sample replace in a mix, but it could come handy for the midi drummers who would like to purchase a good sounding library. How would I describe the Nave Kit? To me it sounds modern, punchy yet also deep, with wonderful amount of detail and ambience captured in, and available to use in your drum replacement program of choice. I found it works well in most modern music scenarios, from rock, alternative to metal as either sample replacement or augmentation. At the current price of $45 (29.99 pounds) it is a great deal for those who look for realistic, well recorded drum samples.